There are two places in which this error can be displayed. This message is displayed when your API key has not been correctly set up, accompanied by a “For development purposes only” watermark on the map tiles. This will also be displayed if you have not set up billing for your API project. 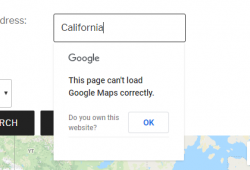 When this message is displayed underneath an address field (store locator address, marker panel address), this is because the Google Maps Places API has not been enabled for this project. 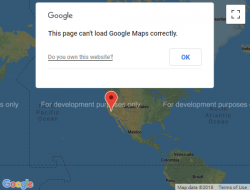 Please refer to our documentation on creating a Google Maps API Key for information on setting your API key.